Have all web content in one place – No more scrambling through email threads, word docs and other files looking for the most up to date version! Receive structured content – GatherContent is based on templates that you can set up to match your design or CMS. Field guidelines can be added to help contributors know how content needs to be structured in terms of copy tone and length or provided to meet asset specifications. Hallelujah! Get assets alongside copy – GatherContent templates can be used to provide assets including text and any file type attachment (up to 50MB) making it easier to understand where assets belong in your website design. Always know the content status – On top of templates, what makes GatherContent different to working in word documents is the ability to apply a workflow status to each item of content in your project (think “Draft, Review, Awaiting Images, Approved…”). Workflow will make it clear when you’re working with the final content. Get content on time – Deadlines can be applied to your GatherContent project and the notification system keeps contributors on track to provide content in line with your project schedule. Save time with migration integrations – GatherContent offers out-of-the-box integrations for many popular CMS’ including WordPress, Drupal, Sitecore and more, as well as an API to take your content anywhere. Automating your migration process with GatherContent will save you crucial hours on copying & pasting and reduce human error in the process. Meet the features that help you receive quality content on schedule. 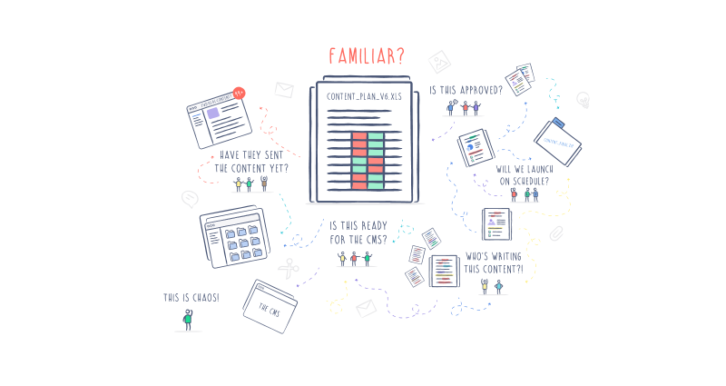 1000s of teams worldwide use GatherContent to implement a structured process for content production that helps launch websites on time. Try it for your next project with a free 30 day trial!